For the first time in my life, I think I feel sorry for the Queen of England. At some point between meeting Prime Minster Theresa May, Boris Johnson, listening to bagpipes, golf in Scotland, lots of executive time, and avoiding protesters, Donald Trump will meet Queen Elizabeth. God help the Queen. It’s the protests that may be the most interesting. Over one million people signed a petition to ban Trump from visiting the United Kingdom. It worked for a while as Trump canceled a previously planned trip. He blamed the excessive cost of the American embassy and blamed Obama, despite the embassy being planned during the second Bush administration. Street protests against America’s wannabe fascist are expected to draw over 100,000 people in London, which Trump plans to mostly avoid. The mayor of London, Sadiq Khan, who Trump has feuded with, says Trump is not welcome in his city. He’s even gone so far as to approve a permit for a giant Trump baby balloon to float above the Palace of Westminster. Trump Baby is a cartoonish depiction of Trump as an infant (about the same age as migrant children he’s been throwing into baby prisons). The floating caricature looks angry, is wearing diapers, and holding a cell phone. Organizers set a fundraising goal of $20,000 for the Trump Baby, which they surpassed. Apparently, more people in London want to see Trump Baby than the real man baby. Some people in the UK don’t like it. UKIP leader Nigel Farage said the plan was “the biggest insult to a sitting US President ever.” Maybe he’s not a history buff and is unaware of the time Britain literally burned down the White House. 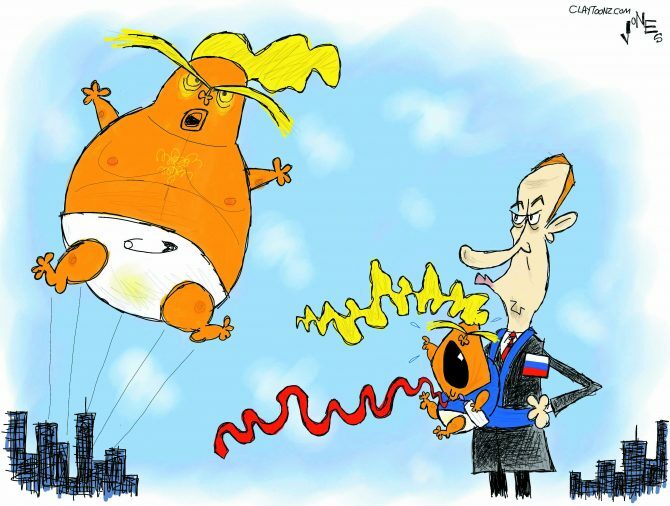 Though Trump Baby has been approved by the mayor’s office, it still needs permits from the National Air Traffic Service and the Metropolitan Police. According to people close to Trump who like to leak embarrassing details about their boss, he really hates being called or treated like a baby, which is really odd because he expects to be coddled everywhere he goes. He’s even planning some alone coddling time with Vladimir Putin during their summit in Finland next week. Maybe they can get a honeymoon suite at the Helsinki Hilton. Since the organizers exceeded their fundraising goal, they plan to send Trump Baby on a world tour. The plan is to have the balloon haunt Trump wherever he goes. I think Tom Steyer, the impeach Trump guy, should spend his billions on funding Trump Baby’s journey. It’d be a more effective way of trolling Trump than those commercials, and funnier too. Perhaps your city could float its own Trump Baby as a Trump deterrent. It may also keep scarecrows out of your cornfields.